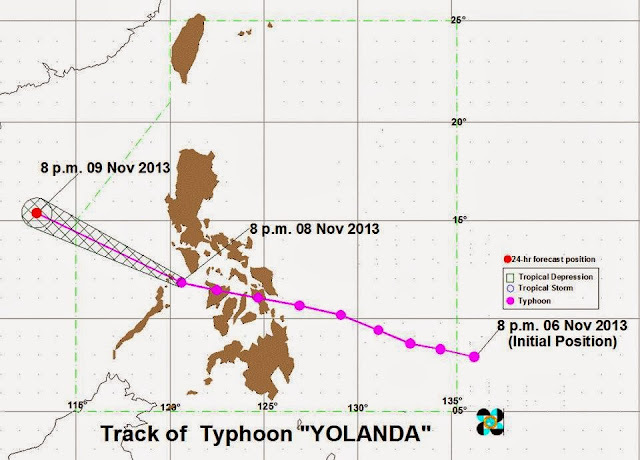 DOST-PAGASA on the latest update for Typhoon 'Yolanda' issued on Friday evening at 11:00 (November 8, 2013) announced that the Super Typhoon has slightly weakened as it moves towards West Philippine Sea. At 10:00 PM today, the eye of Typhoon “YOLANDA” was located based on all available data including Tagaytay Doppler Radar at 30 km West of Coron, Palawan. (12.0°N, 119.9°E). Typhoon Yolanda has a maximum sustained winds of 195 kph near the center and gustiness of up to 230 kph. It is forecast to move West Northwest at 35 kph. Typhoon Yolanda is one of the strongest storms to hit the Philippines, PAGASA said. Typhoon “YOLANDA” is expected to be at 760 km West of Iba, Zambales by tomorrow evening. It is expected to exit the Philippine Area of Responsibility (PAR) around 2 pm tomorrow afternoon. Note that public Warning Signal elsewhere are now lowered. The estimated rainfall amount is from 10.0 - 20.0 mm per hour (Heavy - Intense) within the 400 km diameter out of 600 km diameter of the Typhoon. PAGASA said that sea travel is risky over the seaboards of Northern Luzon and over the eastern seaboard of Central Luzon. The weather bureau advised residents in low lying and mountainous areas under signal #4, #3, #2 and #1 are alerted against possible flashfloods and landslides. Likewise, those living in coastal areas under the aforementioned signal #4, #3 and #2 are alerted against storm surges which may reach up to 7-meter wave height. The public and the disaster risk reduction and management council concerned are advised to take appropriate actions and watch for the next bulletin to be issued.